Outstanding Crochet: New project. 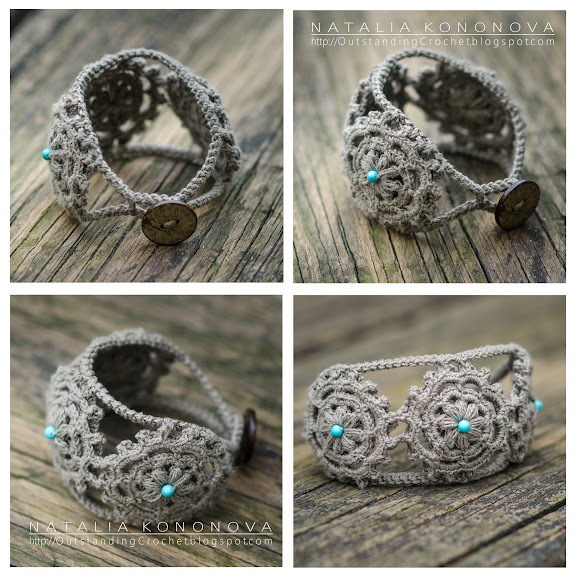 Crochet Boho Bracelet & Necklace. New project. Crochet Boho Bracelet & Necklace. This pattern is available for purchase now. Click on "My Ravelry Store" button under the Header. Some time ago, at the beginning of summer I got an idea to make a bracelet and necklace out of linen thread. I searched for a while until I found unbleached, natural linen thread on Etsy. I placed an order to be delivered from Lithuania, the beautiful country I've never been to, but always wanted to go. I couldn't wait for the delivery and started to make a bracelet and a necklace right away out of cotton thread I had, very close to natural linen in color. I absolutely love the natural look and comfort it gives me when worn. I don't wear necklaces or bracelets or rings, can't stand anything on me, except for earrings sometimes. But when I put this bracelet on, I completely forgot about it for the whole day. This is sooo very beautifull! I would like to make it! Molto belli! Posso copiarli per me stessa? I would like to make this..hope you can share the pattern. Hi, do you have a pattern for this beautiful piece? I do, but due my visa I can't sell anything. I am waiting for my green card, hopefully this year. Hopefully you are keeping tally of who wants which pattern. When the government gets their act together please forward an invoice for this piece. Kind Regards as always I LOVE your work! Thank you, Ambrosia! :))) I will go through comments when time comes, I think soon! Please... where the step by step is? Hi Deborah! As you can see this post dated October 2014. Thus is a blog, so I can not update every post. There is a button under the Header - My Ravelry Store. This pattern is available now along with others and I add patterns as fast as I can. Thank you for your interest in my work!! Good luck and Happy Crocheting!